A long jump triumph by Tianna Bartoletta, Mo Farah’s 10000m win, Mutaz Barshim’s high jump victory and Justin Gatlin’s superb 200m dash were the major highlights of the two-day IAAF Diamond League meeting in USA’s North Western city of Eugene on May 29 and 30, 2015. With the third DL meeting completed, standings are starting to take shape in the 2015 Diamond Race for 16 of the 32 disciplines. At Eugene, ten men’s events show early DL leaders, who had secured maximum points in Doha and Shanghai. In spite of varying results at Eugene, these athletes are still at the top of the table. Kirani James (400m), Mutaz Barshim (high Jump) and Piotr Malachowski (discus) have enhanced their lead with second victories; Konstantinos Filippidis (pole vault), Silas Kiplagat (1500m) and Alonso Edward (200m) are also close to leadership positions despite defeats at Eugene. In addition, Renaud Lavillenie (pole vault), Ayenleh Souleiman (Mile) and Justin Gatlin (200m) have scored first points in their disciplines at Eugene. Of these athletes, Souleiman and Gatlin had already established leadership positions in 800m and 100m respectively at Doha and Shanghai and therefore they lead the table in two separate DL events. Some other men athletes, who couldn’t perform to expectations at Eugene were David Storl in shot put, Jairus Birech in steeplechase, Bershawn Jackson in 400m hurdles and David Oliver in 110m hurdles but they are still in the leadership race. Among women, Eunice Sum (800m), Caterine Ibarguen (triple jump) and Tianna Bartoletta (long jump) have maintained 100% records for the season and they now have eight points from two events. These three women athletes were 2014 DL winners and they look unbeatable in the upcoming events. On May 29, USA’s Tianna Bartoletta led the field in women’s long jump at Eugene to finish with a wind-assisted leap of 7.11m on her third attempt. In the next round, she jumped 6.83m, which was her best wind-legal mark at DL. Canada’s Christabel Nettey was second at 6.99m. In men’s shot-put, American Joe Kovacs hurled to a distance of 22.12 to record a stellar performance. Germany’s David Storl could only manage 21.92m to take the second spot. In men’s discus, Poland’s Piotr Malachowski hurled to 65.59m to win from Compatriot Robert Urbanek (65.42m). India’s Vikas Gowda finished third once again after Shanghai DL. British superstar athlete Mo Farah won 10000m but the double Olympic, world and European champion couldn’t run under his European record of 26:46.57 which he set at Hayward Field in 2011. Regardless, Farah won in 26:50.97s with the second-placed Kenyan Paul Tanui finishing in 26:51.86. Friday evening’s biggest surprise was caused by Ethiopia’s Yomif Kejelcha, who outran the Kenyan Edwin Soi and America’s Galen Rupp s in 5000m to win in 13:10.54. The 17-year-old Kejelcha made a winning move with 300 meters remaining and neither Soi nor Rupp could match Kejelcha’s acceleration in the last phase. Soi clocked 13:11.97 and Rupp was third in 13:12.36. On Saturday May 30, Mutaz Essa Barshim of Qatar stole the show in high jump with three first-time clearances at 2.24m, 2.28m and 2.35m. While Barshim’s arch-rival Bogdan Bondarenko of Ukraine was absent at Eugene, China’s Zhang Guowei caused a flutter by clearing 2.38m. But the brilliant Barshim jumped 2.41m next to emerge victorious. In women’s triple jump, world champion Caterine Ibarguen of Colombia produced a sixth-round leap of 15.18m to take the top spot from Russia’s Yekaterina Koneva. Women’s 100m sprint was won by Jamaica’s Shelly-Ann Fraser Pryce in 10.81s in a rich field of runners. Ivory Coast’s Murielle Ahoure chased Fraser Pryce all the way but she finished second in 10.81. Blessing Okagbare was fourth. In men’s 400m, Grenada’s Kirani James created a sensation by a sub-44 seconds sprint in 400m and in clocking 43-95 came close to breaking Michael Johnson’s meeting record. USA’s LaShawn Merritt was second in 44.51. In a non-DL 400m women’s race, Americans Allyson Felix and Sanya Richards-Ross finished first and second. In 200m sprint for men, Justin Gatlin posted a world-leading and meeting record time of 19.68s. Second placed Anaso Jobodwana of South Africa was way behind at 20.04. In men’s 110m hurdles, Frenchman Pascal Martinot-Lagarde recorded a superb win in a world lead time of 13.06s. Olympic champion Aries Merritt finished second in 13.12. The Bowerman Mile provided a thrill because of the presence of local star Matthew Centrowitz, who threatened to upset Ayanleh Souleiman. But the Djiboutian held his nerves to finish first at 3:51.10. Centrowitz had his career’s best DL finish to take the second place in 3:51.20 and relegated Kenya’s 1500m world champion Asbel Kiprop in third place. In the men’s 3000m steeplechase, Ezekiel Kemboi and Jarius Birech both ran faster than the meeting record of 8:03.59. Kemboi clocked 8:01.71s to Birech’s 8:01.83. In women’s 800m, Kenya’s Eunice Sum was the winner as expected. She clocked 1:57.82 and USA’s Ajee Wilson was second with1:57.87. 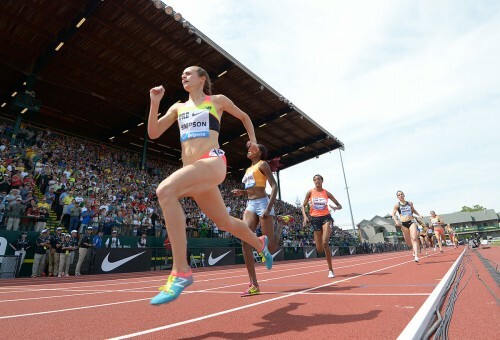 In women’s 1500m, USA’s Jenny Simpson held an upper hand to win in 4:00.98. Kenya’s Mercy Cherono was second in 4:01.26 and Dutchwoman Sifan Hassan finished third at 4:01.65. Ethiopian Genzebe Dibaba became the fourth-fastest woman in 5000m history. Clocking 14:19:.76s, Dibaba was a runaway winner at Eugene, where the rich field comprised of three Kenyans; Faith Kipyegon, Vivian Cheruiyot and Sally Kipyego. Second-placed Faith Kipyegon finished in 14:31.95.